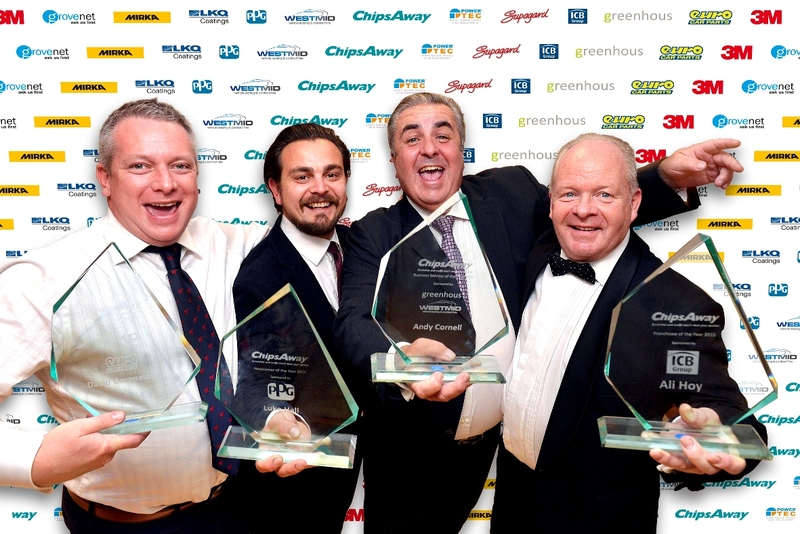 Over 200 delegates congregated at the Hilton, NEC, for ChipsAway’s annual conference and awards dinner over the weekend, celebrating 21 years as the UK’s leading minor car body paintwork repair brand. ChipsAway CEO, Tim Harris, kicked off the event – addressing the crowd and highlighting the Franchisor’s key areas for growth and development going forward. This was followed by a marketing update from Universal McCann, who took the opportunity to announce some major plans for TV advertising in 2016 – and shared the huge successes of 2015’s overall campaign so far, which is on target to generate over £40m worth of work in total! A short film featuring five members of the ChipsAway network, spanning all operation sizes – from a ‘man-in-a-van’ growing to the largest CarCare Centre in the UK, was then played to the captive audience, to help inspire and motivate the network and show just what is possible to achieve with a ChipsAway business depending on their ambitions. Key industry suppliers were also on hand throughout the afternoon at a comprehensive vendor exhibition including 3M, Mirka and many more, where there was opportunity to try out new products first hand. There was even a spray painting simulator for the network to test out their skills, which proved a huge success with everyone! Later on, top performers from the ChipsAway network were recognised and rewarded at an extravagant awards dinner. The highly coveted award for ‘Franchisee of the Year’ went to Alistair Hoy, who along with his wife, son and two employees, has worked hard to build an impressive ChipsAway business currently averaging £1,000 per day turnover, with ambitious plans to achieve £500k per annum turnover within the next few years. Other high achievers included ‘Newcomer of the Year’ Luke Hall, who was awarded for his rapid growth from single man-in-a-van to CarCare Centre in less than 12 months! ‘Marketeer of the Year’ went to Dave Greenaway, who is going from strength to strength having recently expanded his CarCare Centre operation and introduced an evening shift system to undertake more repairs within a day – ensuring his customers aren’t waiting too long for their repairs. Last, but by no means least, ‘Business Mentor of the Year’, which for the first time ever, was awarded to the same person two years in a row – Andy Cornell. His contribution to supporting other ChipsAway businesses within the nationwide network in achieving the very highest standards of customer service, is outstanding and he is a very worthy winner of the accolade. To complete the evening, a raffle raising just over £1,500 for Help for Heroes was held and guests danced the night away!